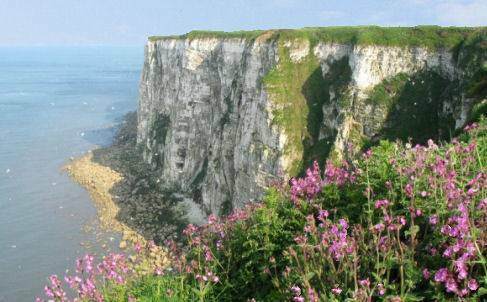 Stunning Bempton Cliffs, which lie on the north side of Flamborough Head, has an RSPB reserve and visitor centre which provides guided walks of the area. 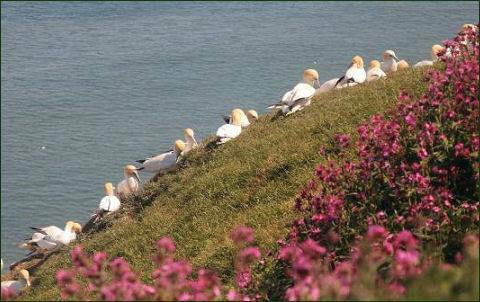 From April to August, the cliffs are alive with nest-building adults or young chicks. Visitors may watch the birdlife from safe cliff-edge viewing platforms. Inside the seabird centre is an exhibition area, with large TV screens showing live images from the cliffs. Bempton Cliffs stretch for about 6 miles (10 km) from Flamborough Head northwards towards Filey and soar to over 100 metres (330 feet) high in places. The hard chalk cliffs at Bempton rise are relatively resistant to erosion and offer lots of sheltered headlands and crevices for nesting birds. One of Britain's top wildlife spectacles and the most accessible seabird colony in the United Kingdom. Over a quarter-of-a-million seabirds swooping, soaring and screech around the towering chalk cliffs. Between March and October, visitors can see puffins, guillemots, razorbills, kittiwakes, herring gulls, fulmars and shags here as well as the largest seabird in Britain, the gannet. The cliffs are home to the only mainland breeding colony of gannets in England, the Northern Gannet migrates to Bempton each season from West Africa and pair for life. They prefer to eat the larger fish such as Cod, Mackerel and Herring which are found futher away from the coast in deeper waters. Gannets can be seen here from January to November, but they are most active between April and August when they are breeding. Around 10% of Britain's population of kittiwakes also nest there, the Kittiwake is our smallest gull and travels to Bempton from the high Arctic The Atlantic puffins at Bempton Cliffs tend to nest in rock crevices, whereas burrows are used at most British sites. 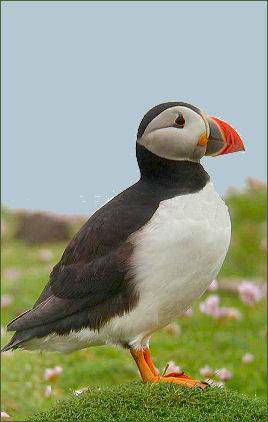 About 4,000 pairs of puffins return to Bempton Cliffs to breed. There are good walkways along the top of the cliffs and several well fenced and protected observation points. A nature trail winds its way around the reserve. The chalk grassland, especially in Holmes Gut, is rich in flowers attracting butterflies and a number of uncommon moths. In Holmes there is an area of gorse scrub which attracts breeding linnet and yellowhammer. The base of the steps into Holmes has a profusion of wildflowers. 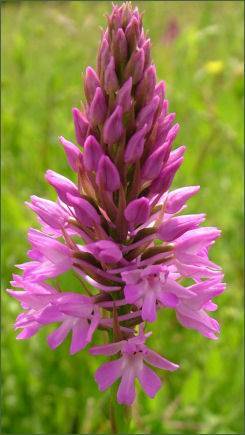 including bird's-foot trefoil, common spotted orchids and pyramidal orchids (pictured right) . Along the cliff edge there is a beautiful show of delicate pink thrift in the springtime and occasionally Northern marsh orchid can bloom in profusion. At Thornwick the two reed beds, though small, host reed warbler, sedge warbler and reed bunting.